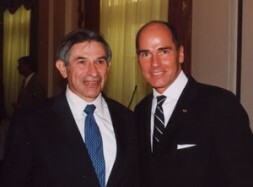 Deputy U.S. Secretary of Defense Paul Wolfowitz (left) at the Washington book party of Dr. Hubertus Hoffmann. The surprise guest of honor spoke about the values of former Pentagon strategist Fritz Kraemer. Only a year after the funeral of American hero Fritz Kraemer at Arlington National Cemetery, more than 100 friends and admirers, officers and journalists gathered at the Army Navy Club in the heart of Washington D.C. at the invitation of Dr. Hubertus Hoffmann, author and President of the World Security Network, for the presentation of the book Fritz Kraemer on Excellence. Missionary, Mentor and Pentagon Strategist. The evening began with an outstandingly delivered speech by his daughter, Madeleine. Sometimes emotional, sometimes light-hearted, she told of how Old Fritz came across in her childhood from the viewpoint of his only daughter. Sven Kraemer, who followed in the footsteps of his father as a Pentagon advisor, stressed the value system and the call for an elite committed to responsibility instead of privileges. They both wrote important contributions for the book about their father. The guests were greatly impressed by Lieutenant General (Ret.) and former Ambassador Ed Rowny who, in spite of his visual handicap, offered an engaging, dynamic, and entertaining description of his encounters with Fritz Kraemer in the fifties, which are recorded in his imminently readable contribution to the book. The surprise guest of the evening was Deputy Secretary of Defense Paul Wolfowitz, who at first eavesdropped on the speeches at the entryway and toward the end of the evening honored the importance of Fritz Kraemer’s work in the defense of America’s values. A completely different crowd came together at the invitation of Sharon Handler, Mark Robinow, Hans Janitschek and Hubertus Hoffmann in New York City. More than 100 bankers, diplomats, movers and shakers from Manhattan celebrated Fritz! The book on Fifth Avenue with a view of Central Park by night. Everyone agreed: it is precisely in today’s materialistic times that his calls for values, intellectual goals, and an elite to take on responsibility are more important and more current than ever. Encounter the ideas of Fritz Kraemer along with contributions by Alexander Haig, Henry Kissinger, Madeleine Kraemer Bryant, Sven Kraemer, Wilhelm- Karl Prinz von Preussen , Edward Rowny, and Donald Rumsfeld in the limited first edition of Fritz Kraemer on Excellence. Order your own personal copy at the special WSN price now!